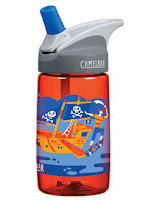 Recently I received the NEW kids bottles from CamelBak, the kids stainless steel and Tritan. The first thing I noticed about these bottles besides the great designs is the size... 12 ounces! Great for on the go or around the house ! I really like that all the pieces are dishwasher safe and BPA FREE ! The flip up and down spout is great. It states they are spill proof and so far with my 3 yr old this is true.....no spill or leaks even when the spout is up (open). 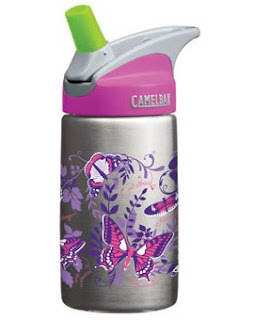 These bottles are great for kids that are allowed to have water in the classroom, no spills for the teacher to worry about ! Great colors and graphics to pick from, something that would fit each kids style! 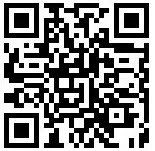 Made from medical-grade stainless steel, with no inner liners or plastic coatings that aluminum bottles require. *Not for children under 3 years. Simplified stem and straw are child-safe yet easy to remove for cleaning. All parts are dishwasher safe.